AMES, Iowa (AP) — Iowa State lost its last seven games in 2017-18 in part because it didn’t have enough players to compete in the Big 12. Fourth-year coach Steve Prohm might have too many guys this season — and how he manages a suddenly-stacked roster will determine if the Cyclones can get back to the NCAA Tournament after a one-year absence. Iowa State lost just one major contributor, guard Donovan Jackson, while adding four highly-rated freshmen and Division I transfers Marial Shayok and Michael Jacobson to its roster. Those additions, combined with expected improvement from preseason first-team All-Big 12 guard Lindell Wigginton and fellow sophomore Cam Lard, should allow the Cyclones to bounce back in the Big 12 after a rebuilding season a year ago. Iowa State opens the season Nov. 6 against Alabama State. Wigginton explored his NBA options, only to return to school in hopes of becoming a first-round pick in the 2019 draft. 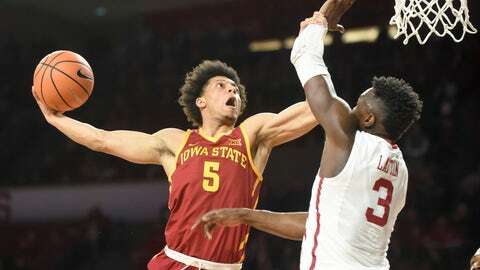 The 6-foot-2 Wigginton was only the fourth freshman in school history to start every game, and he averaged 16.7 points, 3.7 rebounds and 2.8 assists while breaking the Iowa State record for 20-point games (13) and 3s made (69) for a first-year player. It will be interesting to see what Prohm does with Wigginton — by far his best player — in 2018-19. Iowa State’s best lineup a year ago featured Nick Weiler-Babb at the point and Wigginton as a shooting guard focused on getting buckets, not assists — a natural fit for him. “I wanted to come back and be considered a winner. That’s really all I want to do this year. I just want to win,” Wigginton said. Lard, a 6-foot-9, 245-pound power forward who runs the floor like a wing, spent time this summer at a wellness center in Massachusetts in an effort to clean up his life. If it turns out that he did, good luck to his fellow front court players in the Big 12. Lard averaged 12.6 points, was fourth in the league with 8.1 rebounds and third with 2.2 blocks a game in his first season in Ames. Shayok, a senior from Virginia, and Jacobson, a junior who played at Nebraska, are expected to provide veteran leadership for a team with a host of talented underclassmen. Shayok will likely start on the perimeter — especially if Iowa State plays a smaller lineup. The 6-foot-10 Jacobson, who grew up about 30 miles south of Hilton Coliseum in Waukee, Iowa, should give Iowa State length and size off the bench. Jacobson was second in the Big Ten in offensive rebounds in 2016-17. Freshman Talen Horton-Tucker is a 6-foot-4, 233-pound shooting guard who is expected to start and contribute immediately. Freshman point guard Tyrese Haliburton looked like a candidate to redshirt and take over for Wigginton in 2019-20 but has been so impressive in offseason workouts that he’ll likely earn a spot in Prohm’s typically tight rotations. Zion Griffin battled knee injuries all summer and might need a redshirt year before he’s ready to make a difference. Iowa State could do the same with the 6-foot-10, 216-pound center George Conditt IV. Iowa State has all the elements of a sleeper team in the Big 12 and beyond. The Cyclones have a nice mix of talent and experience, and Prohm showed he can win in Ames after leading them to the Sweet Sixteen and a Big 12 Tournament title in his first two seasons.